Although the advent of podcasts means that listening to online radio isn't as popular anymore, you can still find many stations on the web. FStream is the ideal tool to enjoy them as it focuses on playing and recording radio streams. Offering a discreet and functional interface, unobtrusive FStream can play any online radio station without ever interfering with your other applications. The program uses up very little memory and can be switched on or off very quickly as it simply uses internal QuickTime plugins to play streams. Both the player and recorder functions are very easy to use although lack any advanced functions, such as an equalizer. Thanks to recent improvements, it's now much easier to add and organize new streams. The preset view allows you to see stations by lists, whether ShoutCast or SourceMac and you can easily import new streams straight from iTunes. The only downside is that FStream doesn't allow you to browse for new streams. Note that, since version 1.30, FStream no longer supports Tiger OS X 10.4 and lower but when you click download, we've also provided a link here for those Mac users on older OS's than don't want to miss out. 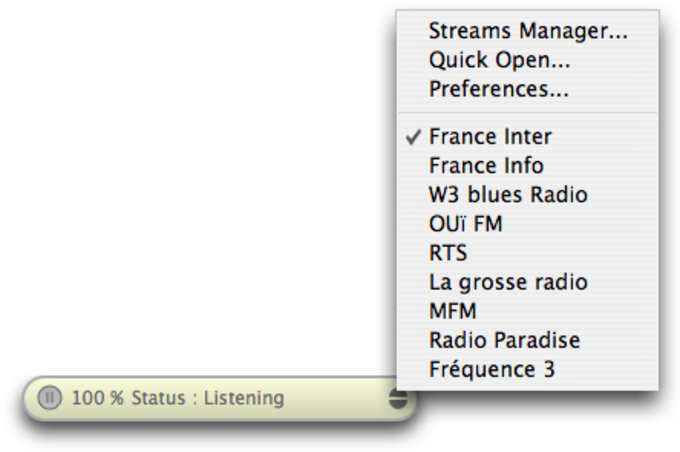 An unobtrusive yet functional application, FStream is great to listen to and record your favorite online radio streams. Update of the Apple Remote management code (use of the iospirit framework). FStream is now also compiled in 64-bit. Instructions?. As far as I can decipher, after hours of searching - you must be a computer programmer to actually use this program. I tried adding a URL from several different types of sources (.asx, php, .pls), but in each case absolutely nothing happened. The program did not appear to attempt to connect or play the stream. If some step by step instructions were available (for the layman), perhaps this program could actually work? I'm using Mac OS 10.7.1. Proclaim the choice. I wanted an app to play internet radio, but the stations I was interested in such as ABC and BBC. Nearly all internet radio apps had their own stations selection, and did not make it easy to add stations. With FStream there was no such crap. Only one station showed its functioanlity. Adding my choice was easy. Just find the link in the browser, copy, and add station. No clutter. My choices only. FStream should proclaim the freedom of choice. Simple,easy to use for a first time user, this is my first iPod Touch, only had it for a week. Beats the competition easily. What do you think about FStream? Do you recommend it? Why?